Coeliac-Friendly Adventures: Sydney Chocolate School by Coco Chocolate – Bye, Gluten! A food hub for young coeliacs. 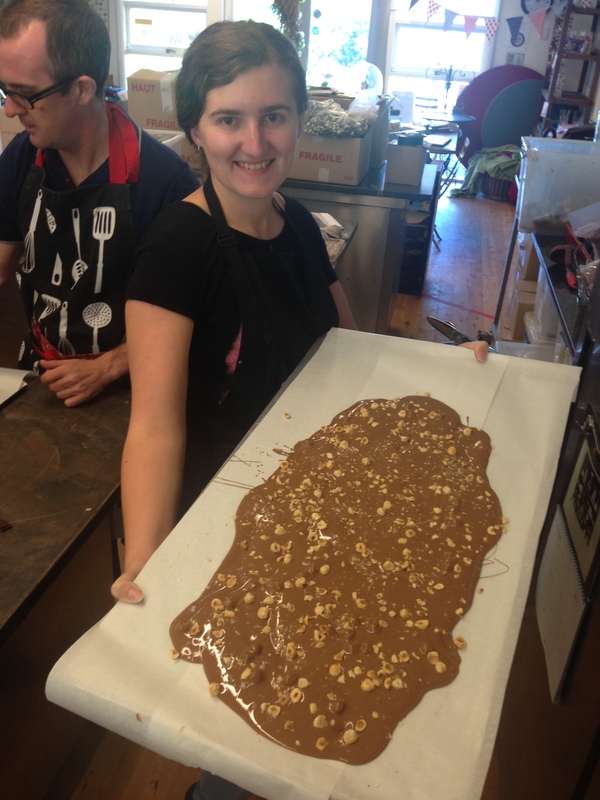 Recently, I had the pleasure of partaking in a chocolate making class by Sydney Chocolate School. This school is run by Coco Chocolate, which makes amazing handmade delights that use quality ingredients, and are all gluten-free. That’s right, ALL. So, you can bet that the goodies you’ll be making during the class will be gluten-free! First off, let me tell you that the location of the class is BEAUTIFUL. The grass was green, the sky was blue, and you could see boats sailing nearby. Chocolate with a view! What more could you want? So, for the class itself, you are taken through the entire process of making 3 different variations of chocolate. Along the way, your wonderful teacher will drop knowledge-bombs on you, answer any questions you have and feed you chocolate. The first thing we made for our session, was a bar of dark chocolate. They took us through the process of tempering chocolate on their marble tables. It was surprisingly not that difficult. If I can do it, you can do it. Don’t let Masterchef fool you. It’s all about heating and cooling and heating and cooling and swishing it around on the marble every now and then. Making a normal block of chocolate was a nice way to ease us into it and get us used to the timings and temperatures. The finished product was pretty awesome. It looked like a legit, commercial bar and even made a snapping noise when we broke it (the hallmark of good tempering). The dark chocolate was wonderfully rich and had a bite to it, without being too aggressive on the palette. The second thing we made was a slab of milk chocolate with sea salt and crushed hazelnuts (YUM). This was my favourite one. This time we tempered milk chocolate. We got to express a bit of flair in how much of the ingredients we added and its aesthetic. I was quite generous, let’s just say that. The combo of sweet, salty and nutty was perfect. I died. To finish the day we made a silky, dark hot chocolate with cardamom and cinnamon. Making the hot chocolate was probably the most interesting process. Once again, we tempered dark chocolate. We were pros by this stage. Our teacher then added the cinnamon and cardamom to the bowl of gooey chocolate goodness. It smelt amazing. We then poured it onto the table top, spread it thinly and waited for it to cool. Once the chocolate was hard, everyone gathered around and started scraping at the chocolate to make ribbons. The teacher collected it and made hot chocolate from it. It was like a hot chocolate and a chai latte had a baby. It would be perfect for a Friday night watching rom-coms. At the end of the day we got to take home a cute, little gift bag with some of the treats we made. We also received a certificate of completion. Note: for all the greedy guts like me, don’t be too disappointed when you open your bag and find that it isn’t filled to the brim. Most of the chocolate you make will be sent to the Coco Chocolate store in Kirribilli, to be used as samples. Just imagine all the joy you’re giving those sample-eaters. So, if you’ve got a friend with coeliac disease and want to give them a cool gift OR you want to have an indulgent gluten-free day for yourself, check out Sydney Chocolate School! If you want all the fun without all the work, visit Coco Chocolate!